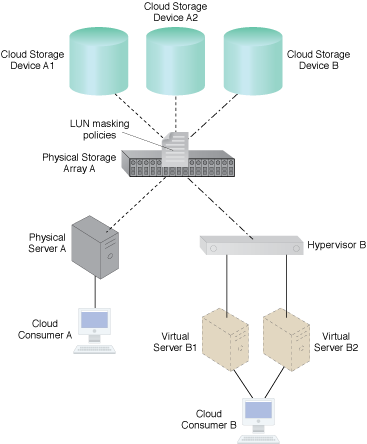 How can data stored on a cloud storage device be isolated to specific consumers? Data stored in a shared cloud environment can be vulnerable to unauthorized access by other cloud consumers. A solution is implemented to isolate each cloud storage device from being presented to or accessed by unauthorized cloud consumers. A LUN masking mechanism can enforce defined policies at the physical storage array in order to prevent unauthorized cloud consumers from accessing a specific cloud storage device in a shared cloud environment. LUN masking policies can be enforced by a mechanism at Physical Storage Array A.